Delta vs Cartesian vs Polar vs Scara: FDM 3D printers come in many shapes and sizes. Learn to tell the differences and advantages. Desktop FDM 3D printers have only been around for a few short years, but already their appearance has begun to evolve. With their rectangular, boxy shape, the early designs of Fused Deposition Modeling (FDM) printers tended to be derivatives of the RepRap Prusa Mendel. Today, however, we’re moving into a secondary phase of more sophisticated designs. Why? Simply because engineers, makers and tinkerers want to build the best machines that they can. And they’re constantly thinking outside the box. Here’s your guide to the categories of FDM 3D printers, with considerations for the advantages and disadvantages of each. Let’s start with the Cartesian 3D printers, the most common design found in consumer 3D printers. Cartesian 3D printers typically have a print bed which moves only in the Z-axis. The extruder sits on the X-axis and Y-axis, where it can move in four directions on a gantry. This principle can be seen in action on popular models from Ultimaker and MakerBot. There are variations, however. With the Printrbot Simple, for example, instead of moving the print-head purely in XY space, one of the axes are changed by moving the print bed itself. This is a mechanically simpler design, and therefore easier to maintain, but at the sacrifice of printing speed. 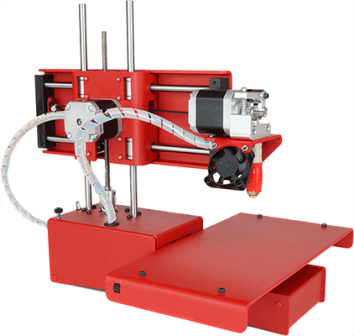 Another style that’s growing in popularity is the Delta 3D printer. Delta 3D printers also work within the Cartesian plane, but as you can see when you look at the SeemeCNC Rostock, there’s no chance they’d be mistaken for anything else. Identifying characteristics start with the circular print bed. The extruder is suspended above the print bed by three arms in a triangular configuration, thus the name “Delta”. Delta 3D printers were designed for speed, but they also have the distinction of a print bed that never moves, which may come in handy for certain print jobs. However, it’s sometimes argued that this category of printer is not as detailed or as precise as its Cartesian sibling. Third in our list are Polar 3D printers, an emerging design that shows a great deal of promise. Moreover, Polar 3D printers can have a greater build volume within a smaller space, lacking the requirement of a XYZ framework to move around. Hoo-boy. Now we’re venturing into experimental turf. The Selective Compliance Assembly Robotic Arm (Scara) is a very precise system with a tiny footprint. A Scara 3D printer looks and moves much like an industrial robot on a car assembly line might, but this is purely in the service of your plastic doodad quota. The RepRap Morgan can be yours for less than $1,000, but requires quite a few custom parts in its construction. So currently this scara 3D printer is very much in a category of its own, but there’s definitely room to grow. License: The text of "3D Printers Explained: Delta, Cartesian, Polar, Scara" by All3DP is licensed under a Creative Commons Attribution 4.0 International License.